During one of the classes, Pakistani journalist Mr. Ghazi Salahuddin was invited by course instructor Dr. Asif Aslam Farrukhi, as a guest speaker. Habib University’s academic programs and its faculty continually design courses to encourage students to become aware and comprehend, analyze, and approach the past, present and future in a unique manner. One of the elective courses introduced this semester, ‘The Unwritten Epic: Reading the Partition in Fiction and Film,’ has been enjoyably educational and brought about a change of mind-set in students. Taught by instructor Dr. Asif Aslam Farrukhi, the course explores the historical events of 1947 and thereafter through novels and films focusing on various aspects of the continuing saga of rupture and disarray in South Asia. The events of 1947 and the emergence of separate states is discussed as a part of a longer process leading to 1971 and other events across South Asia, with focus on selected fictions of Manto, Qurratulain Hyder, Attia Hossain, Khushwant Singh, Bapsi Sidhhwa and Bisham Sahini; and selected films. During one of the classes, Pakistani journalist Mr. Ghazi Salahuddin was invited by Dr. Asif, as a guest speaker. Besides being a journalist, Mr. Salahuddin is a writer, literary figure and scholar of political science. He has written various analytical columns, both in Urdu and English, in the News International, Jang and has often appeared in Geo Television for independent commentary on Pakistan’s current affairs. During an exceptionally lively and entertaining session with Mr. Salahuddin, the students not only listened to his stories attentively, but so did he in turn listen to the students, absorbing their point of views. Rather than a one-sided ‘lecture class’, it was more of a highly engaging Q&A session from both. 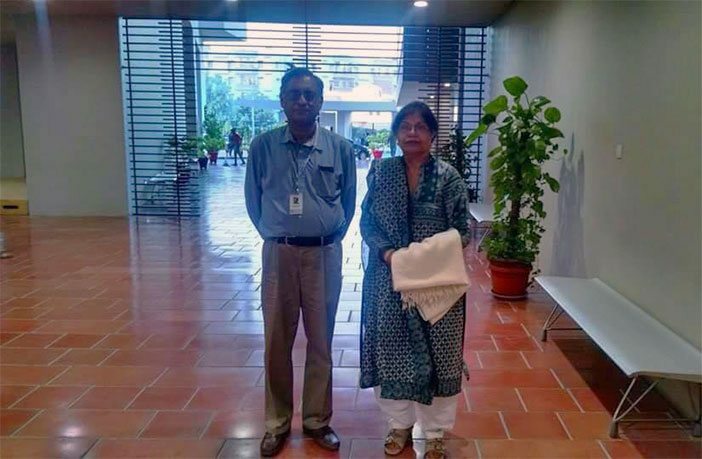 Course instructor Dr. Asif Aslam Farrukhi with Ms. Zaheda Hina on campus. – Photograph by HU Junior Ali Rizvi. Another session of the same course was blessed by acclaimed writer and social analyst Ms. Zaheda Hina, also invited by Dr. Asif. Ms. Zaheda wrote her first story when she was only nine years old. She was associated with the Daily Jang from 1988 until 2005, when she moved to the Daily Express, Pakistan. She has also worked for Radio Pakistan, BBC Urdu and Voice of America. She has written more than two thousand journalistic articles, while many of her short stories have been translated into English, Bengali, Hindi and Marathi. An hour long Skype conversation with the brilliant author and historian Urvashi Butalia. The following blog was written by Nazish Rizwan, Junior at HU’s School of Arts, Humanities & Social Sciences (AHSS), majoring in Social Development & Policy (SDP), Class of 2018. These were the first questions Urvashi Butalia asked the class, which really got me thinking how did we come to harness so much of our emotional and intellectual attachment to the topic. As part of Habib University’s elective course ‘The Unwritten Epic: Reading the Partition in Fiction and Film’, we were blessed with the privilege to indulge in an hour long Skype conversation with the brilliant author and historian Urvashi Butalia, who joined us from India. Parts of her book ‘The Other side of Silence’, were discussed at length during previous class discussions led by my colleague Fatin Nawaz, giving us goosebumps and another reason to acknowledge the terrifying realities of the partition which are gradually being forgotten by generations under the popularity of state-sponsored textbooks that elucidate only the high-politics of the great divide. Butalia answered the primary question she posed in the beginning herself by highlighting the importance of the low-politics, the intimate associations one has with such an event, the strength of stories that make up an individual’s experience and that ultimately they are equally important in defining how the partition should be read and remembered. It is easy to be reminded of a linear and hard lined set of events every August that project the partition as something inevitable; and so learning new things about it is tough and humbling in many ways. Several students shared their own final research projects for the course with her, including the methodological issues they were facing in conducting the research, looking for guidance and a curiosity whether a similar sentiment regarding a facet of partition existed in India. For every question posed, she eloquently answered stringing together alternative ways to humanize our primary methods of research by focusing on building trust and connections with the people instead of posing direct questions. She also helped students with providing books, references and narrating her own stories relating to the partition. I would like to thank our course instructor Dr. Asif Aslam Farrukhi who always makes sure that we not only read unconventional scholarly work, but also meet and/or talk to the scholars, thereby making us aware of not only the context of the work but also the workings of the scholarly mind. These discussions, in turn, add a nuanced layer to our understanding of the work and make us think in a dimension in which we have seldom thought. To read more Blogs by our HU Lions, click here for Lion Blog Central.